The history of the Illinois National Guard begins with volunteer militias that go back to the 1812 siege of Chicago’s Fort Dearborn where “twelve militia men” were listed as casualties of the battle. My first encounter with the city’s early military organizations began with research for my Hidden Truths project. For David Kennison’s spectacular military funeral of 1852, in addition to representatives from the U.S. Army, participating city militia regiments included the Chicago German Battalion, the Ringgold Guards, the Washington Battalion, the Montgomery Guards, and the Chicago Hussars and Light Artillery Brigade. The Illinois National Guard regiments that occupied Block 21 descend from the 1st Regiment Illinois Volunteer Cavalry, which mustered into service in the Civil War on July 3, 1861. The building was initially called the First Cavalry Armory, but by the time the regiment moved its headquarters to East Chicago Avenue in 1917, the unit had become the 2nd Field Artillery preparing for its participation in World War I. The 106th Cavalry evolved to include the Black Horse Troop, a ceremonial unit of elite horsemen. The Black Horse Troop escorted dignitaries and paraded on special occasions. In 1933, as the Troop's Commander, Michael Butler's father, Paul, led the parade down Michigan Avenue to open A Century of Progress, Chicago's World Fair. See a photograph of that parade on the Audio Conversation page at the left. By permission and courtesy of the Chicago History Museum. 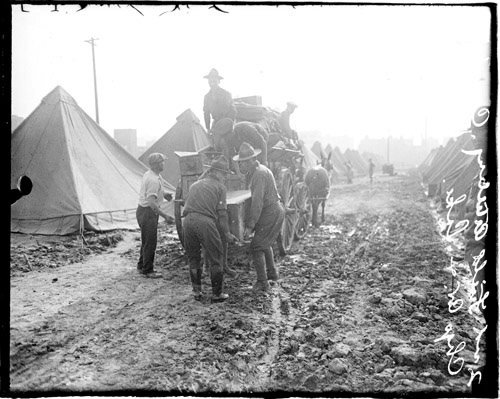 The 1917 Chicago Daily News photograph at the right shows members of the newly formed 2nd Field Artillery setting up camp in Block 21's Lake Shore Park while the new armory building was under construction. Within a month this group became the 122nd Field Artillery Regiment of the 58th Field Artillery Brigade and in the next year shipped out to France for World War I service.